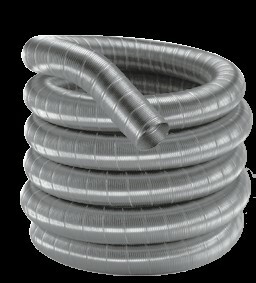 This 20' chimney liner is designed for use with the DuraVent DuraFlex Zero Clearance Insulation Sleeve, in order to meet the UL 1777 standard for masonry chimneys and wood burning appliances. It boasts itself to be the most economical liner for straight chimneys, and is incredibly sturdy, despite its light weight. The liner is constructed with a .006" metal thickness, and has an 8" diameter. It comes with a manufacturer's limited lifetime warranty for your peace of mind.